This two-bedroom beach condo located in Gulf Shores on the Alabama Gulf Coast with 1200 square-feet and two balconies with an excellent water view of the Gulf of Mexico and Little Lagoon. This property has been is well furnished and in an established rental program - an unobstructed views to the east provide an excellent view of the sunrise over the gulf as you have your morning coffee and ponder the days activities. Find the ideal Gulf Shores vacation home for you and your family – a variety of properties, from low-rise to high-rise condos, are available on Alabama’s beautiful Gulf Coast that can fulfill your needs. From studios and one-bedrooms with hallway bunk-beds to large gulf-front penthouse condo that comprise an entire floor of the building. A beach real estate investment in a Gulf Shores condominium includes the numerous benefits of Gulf Coast living, such as water-sports, championship golf courses, deep-sea fishing, shopping, the freshest seafood – with the popular sugar-white beaches and small-town southern charm the area is well know for. 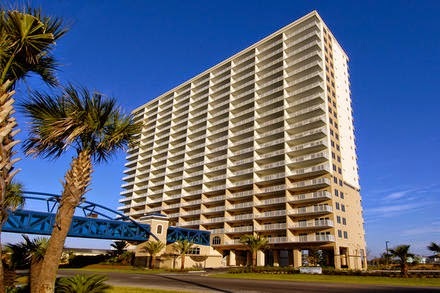 Gulf Shores Alabama Condo For Sale.